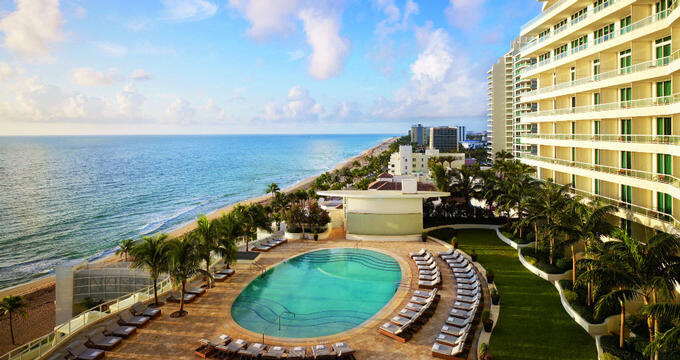 The Ritz-Carlton Fort Lauderdale is a luxury, oceanfront hotel located on the coast of the Atlantic Ocean. It has received a four-star rating from Forbes Travel Guide and is the only AAA Five Diamond hotel in Fort Lauderdale, Florida. The hotel offers large rooms and suites with premium amenities, a heated, outdoor pool, multiple dining options, a fully staffed spa and fitness center, and much more. The hotel offers three different room classifications - rooms with an oceanfront view, rooms with a partial ocean view, and rooms with an intracoastal view. All rooms are 300 square feet, designed with an “oversized” floor plan to provide guests with additional comfort. Oceanfront view rooms offer balconies overlooking the Atlantic Ocean. Each of these rooms offers hotel guests a choice between a king bed or two double beds. 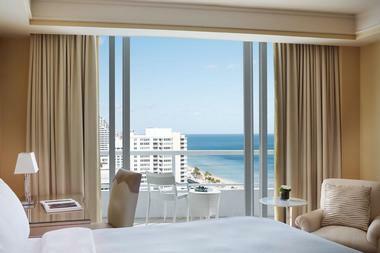 Partial ocean view rooms offer some view of the Atlantic Ocean, but also a view of the intracoastal area of Fort Lauderdale. Hotel guests can also choose between a king bed or two double beds, and these rooms also offer an additional chaise lounge. Intracoastal view rooms offer only a king bed and a chaise lounge but do feature a balcony that overlooks Fort Lauderdale and some of the surrounding waterways. The Intracoastal Junior suite is the smallest option at 400 square feet, but it does provide guests with a balcony featuring waterway views. The master bedroom has a plush king bed, and guests can also stay on the sleeper sofa in the living area. The Oceanfront Suite is slightly larger, at 600 square feet. It features a balcony with views of the Atlantic Ocean, a master bedroom with a plush king bed, and a living area with an additional sleeper sofa. The largest option, The Ritz-Carlton Suite, is more than twice the size of the Oceanfront Suite at 1300 square feet. The attached balcony offers views of both the intracoastal waterways of Fort Lauderdale and the Atlantic Ocean. Connecting rooms are also available. It features a king bed. For all rooms and suites, cribs and additional rollaway beds are offered on request. All beds are furnished with goose down comforters and foam pillows. All bathrooms are full marble, with a separate shower and bathtub and a double sink. Each bathroom also comes with a lighted make-up/shaving mirror, a hair dryer, a bathroom scale, premium bath essentials from Asprey, and two Ritz-Carlton branded bathrobes. Each room and suite also features wireless internet access (enhanced access is available for an additional fee), a 37 inch flat screen LCD television with a selection of complimentary cable stations as well as premium movie channels, iPod docking stations, a computer friendly work desk (complete with wire hookups and a comfortable desk chair), an honor bar with a refrigerator (featuring a variety of snack and drink options), multi-line telephones, complimentary morning newspapers, and an in room safe that is compatible with storing laptop computers. Housekeeping services are provided twice daily, which includes evening turndown services. Dogs of up to 25 pounds (no more than two per room) are allowed with a non-refundable pet fee. In addition, the daily resort fee charged with each room includes the use of two beach chairs and a beach umbrella, two bottles of water (either at the beach or at the pool), two signature cocktails at the Burlock coast restaurant, one fitness class (lasting 60 minutes), two bike rentals (for up to four hours at a time), and a pass for a water taxi. This resets daily. Overnight laundry services are available on-site. The hotel also offers a business center with over 24,000 square feet of available meeting space that features views of the Atlantic Ocean. The business center has copy and fax service, a translator, overnight delivery and pickup, network and internet printing, and post/parcel service. Concierge services and valet parking (both full and half day) is also available. The Ritz-Carlton Fort Lauderdale was designed to be ADA compliant and accessible. This starts at the main entrance and continues into the entrances for the pool, spa, fitness center, and business center. Service dogs are always allowed for hotel guests with disabilities. 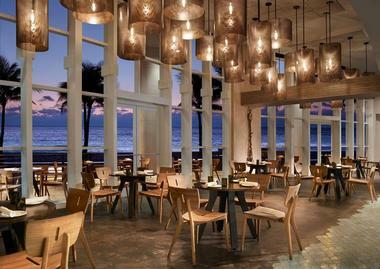 Located inside The Ritz-Carlton Fort Lauderdale, the Burlock Coast Seafood and Spirits restaurant celebrates coastal fare with an innovative spirit. The menu is nuanced modern coastal food, which is served for breakfast, lunch, and dinner. They also offer a brunch menu on weekends, as well as a permanent kids’ menu. The restaurant also participates in Happy Hour, as well as offering weekly Marketplace Features that provide discounts on certain items depending on the day. Reservations are recommended, and private dining rooms are available for special occasions. Menu highlights include the artisanal cheese charcuterie, shareable plates like fried oysters and pork belly tacos, a raw bar, and specialty cocktail list. For outside dining with a spectacular view of the Atlantic Ocean, the hotel also offers the Poolside Cafe. Located on the elevated pool deck, the cafe is open from late morning through early evening. They offer a variety of both alcoholic and nonalcoholic drinks (both individual and by the pitcher), coolers where hotel guests can choose a selection of up to five different beers, wine by the bottle or by the glass (sparkling, rose, white, red), and both local and domestic beers. They also offer healthy food options, appetizers, salads, sandwiches, burgers, tacos, and desserts, all of which were designed specifically to be eaten quickly poolside on a warm day before diving back in. The Ritz-Carlton Fort Lauderdale also offers an extensive room service menu 24 hours a day. The menu offers breakfast, lunch, dinner, and dessert options (some of which were created by Burlock Coast). Wine (by the bottle or glass), beer, and cocktails are also available as well as non-alcoholic options like coffee, energy drinks, juice, and soda. They also have a kid’s menu. There is also a fully functional space in the Ritz-Carlton Fort Lauderdale. The spa is open seven days a week and offers hotel guests massages, facials, manicures and pedicures, hair services, and full packages and experiences. It is recommended that guests contact the Spa Reservation Department staff to discuss and schedule spa services. The spa is 8500 square feet and offers 10 different treatment suites as well as a couples’ suite. There are separate lounges for women and men. A gift boutique is also available. The Ritz-Carlton Fort Lauderdale has a heated, 29,000 square foot pool with a tropical pool deck and dedicated poolside service. In additional, beach side chair and towel services are available during the day. Hotel guests can also reserve private, VIP oceanfront cabanas. These packages include a fresh fruit display, bottled water service, an individual flat screen television, an iPod docking station, and captain service. In addition, the hotel has an expansive fitness center that overlooks the coastal waterway. Fitness classes are offered and taught by on-site spa personnel as well, although that does require an additional cost. Classes include Zumba, Tabata, yoga, and cardio classes. In addition, classes can be accessed live on the television in each room and suite. Private classes are also available on request. Hotel guests are provided exclusive access privileges at the nearby, members only Grande Oaks golf course. The golf course is a par 71 course that measures 6680 yards (from the tips). Guests that choose to golf there will be greeted personally, given their own personal locker, and given access to a personal golf attendant that will introduce them to the golf course and answer any potential questions. Hotel guests will also have access to all of Grande Oaks amenities, which includes the on-site bars and restaurants. The golf course is closed on Mondays. Other nearby activities and attractions include the IGFA Fishing Hall of Fame and Museum, the Fort Lauderdale Beach Park (one of the top local diving spots), The New River, Las Olas Boulevard, the Museum of Art Fort Lauderdale, and the Museum of Discovery and Science. One of the best ways to see as much as possible is to take a trip via water taxi. The taxi stops at multiple locations on the Intracoastal waterway, including the Bonnet House Museum and Gardens (a large plantation style home and exotic garden that hosts art exhibitions and live music regularly) and the local favorite Bistro on the Beach coffee restaurant. On-site concierges are available to help plan any excursion outside of the hotel. Contact The Ritz-Carlton Fort Lauderdale front desk for additional help and information.